Our cover feature this month is from a central Oregon builder named Wood Iron Tiny Homes. This family-owned business has an artistic, Craftsman style with contemporary details. Spud, the family’s patriarch, is the leader behind the tiny house builds. If you are interested in a unique quality home be sure and check them out. 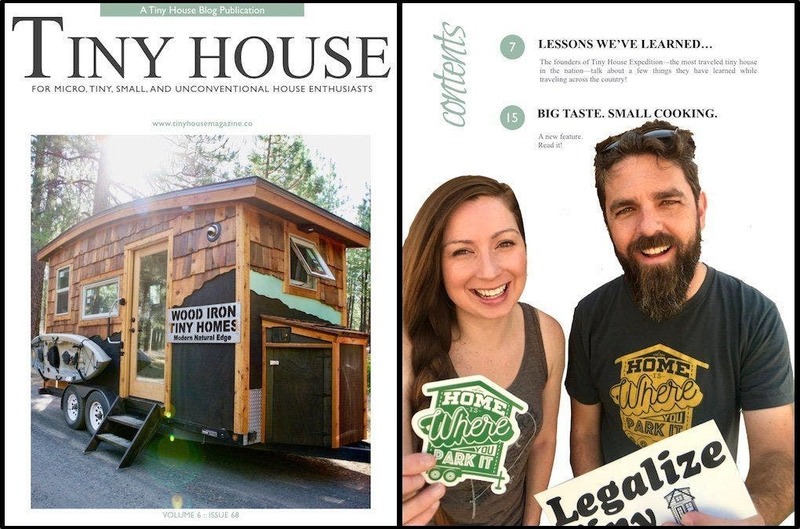 I’m excited to introduce a new monthly feature for Tiny House Magazine. Written by former restauranteur and now tiny houser, Carmen Rose Shenk, the feature will showcase simple, authentic foods that can be prepared in small spaces! Carmen, aka The Tiny House Foodie, is also the author of the new, best-selling book Kitchen Simplicity. Alexis and Christian have traveled over 50,000 miles in their tiny home over the last three years. I had the privilege of meeting them when they were just starting out and have enjoyed our friendship and collaborations ever since. Learn from their own experience the lessons you will need if you plan to travel with your tiny home. This and so much more in this month’s Tiny House Magazine. Enjoy! You can purchase the issue HERE and also subscribe if you chose.